Steam System Optimization Program (SSOP®) is TLV’s flagship assessment service, a sustainable asset management program that continuously optimizes the performance of the entire steam system through visualization. In this program, TLV’s Consulting ・ Engineering ・ Services (CES) specialists assess and provide visualizations of the performance of clients’ steam systems, optimize these steam systems with innovative solutions, and implement long-term management programs to ensure that the system remains sustainable. 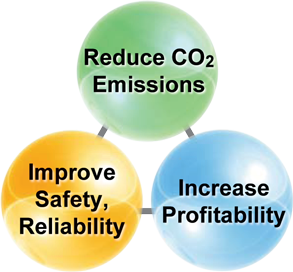 The goals of SSOP® are to improve safety, reliability and profitability by minimizing condensate problems and steam loss, thereby reducing plant energy use and CO2 emissions. Through SSOP, TLV is helping plants build a low-carbon society. By expressing the performance of the steam system through visual aids, CES specialists expose problems and make clear how the system can be improved. By designing and implementing a clear system of appraisal, management, and inspection, CES specialists ensure that the steam system remains consistently and continuously optimized and sustainable. Optimize the entire steam system. Optimize all steam applications such as steam-using equipment, tracing. Optimize all condensate discharge locations.